Well how else can you eat it? Once when I was in a coffee shop. I got a piece of pumpkin pie. The guy that was getting my pie asked if I would like wipped cream. "Yes" I said happily "and plenty of it" I added. He put three nickel sized dots on the pie... Three dots! I ask for more. He said "well bla bla bla because of bla" or something like that. After a quick discussion the manager came up and offered more whipped cream for my pie if I would kindly put down his server and remove my hands from his throat. 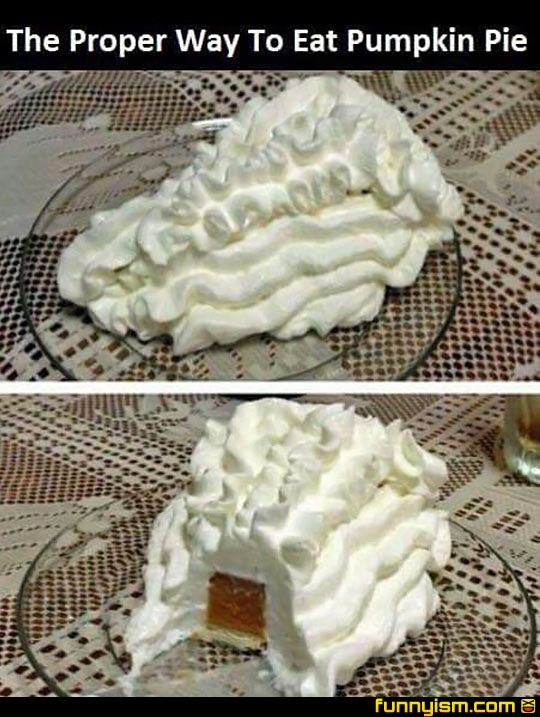 No the proper way is to remove that orange thing in the middle then put more whip cream. @The Puppet Man, dear god a single upvote is insufficient. At first I didn't see the plate and thought it was just sitting on a bed or something. @CaitlinNoel, of course. Why not?